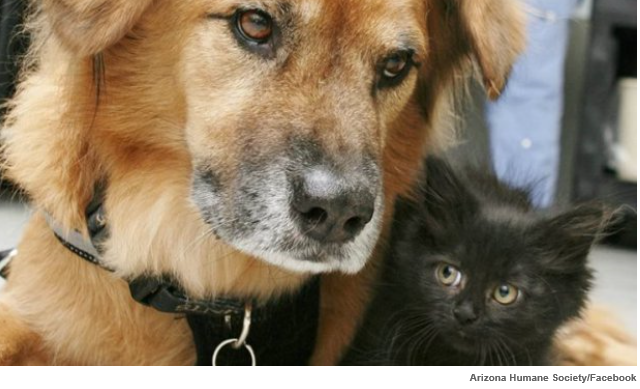 Nine years after the trauma of Hurricane Katrina rocked his world, a sweet-natured rescue dog named Boots has found a successful new life as a volunteer nanny for nervous kittens at an animal shelter run by the Arizona Humane Society. Boots, now 12, found his own second home long ago, when he was adopted by a volunteer at the Arizona Humane Society in Phoenix. He was one of hundreds of pets who became separated from his family in the aftermath of the devastating New Orleans flood. His owner discovered that the Zen-like calm of this golden retriever/chow mix had a happy effect even on the cats in her home. So now, Boots spends Wednesday mornings at the shelter, greeting incoming kittens and giving them a welcome snuggle. The project is designed to increase the adoptability of the kittens by giving them “one day of positive playtime and socialization” with the accommodating Boots, according to a post on the shelter’s blog. The theory is that kittens introduced to Boots when they’re between the ages of two and seven weeks will be more tolerant of dogs in general. That makes them eligible for adoption into a wider range of homes, and less likely to be returned as problems develop between pets. “Studies have shown that cats have a small window of time in kittenhood during which exposure to new things will directly impact their acclimation to changes as they get older,” the shelter staff explains. 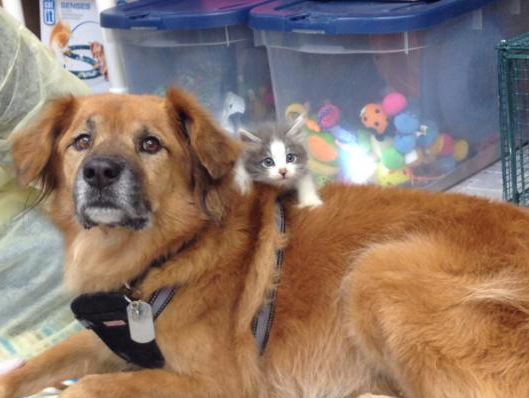 Flush with the success of Boots the nanny dog, the shelter now hopes to expand its Kitten Nursery program to include exposing them to other things that make kittens crazy, like a ride in a car and the sound of a vacuum cleaner. What a lovely thing to do for frightened kittens, brought in to somewhere strange. Bless him. There is goodness in so many unexpected places. Welcome! What a great dog to show it’s tolerance of cats in such a way. It will serve the kittens well. Beautiful story Theresa. What a wonderful dog. Makes you just want to hug him, doesn’t it??? We definitely need a “Boots Camp” to train other dogs in caring for kittens and puppies. I want to reblog this. Love the “Boots Camp” idea. Thank you for the re-blog. We need “Boots Camps” across the country to make life easier for kittens and puppies. Such a happy retirement job for Boots. Great story! Would that my retirement be so rewarding! I adore this kind of story. Wonderful dog and wonderful story. Such stories warm the heart, don’t they??? What a wonderful idea! Anything to make the kittens more adoptable. My 14 year old cat will not tolerate dogs. Animal lovers often have a mixture of cats and dogs so it is important that they get along. I wonder what would work to make puppies grow up to tolerate cats? Maybe a cat nursery? Thanks for the great story! And thanks for visiting my humble blog. I love stories like this! What a wonderful program and what a sweet soul Boots is. And certainly not to forget the good person that took Boots in and gave him a second chance at life.